Health and Beauty Girl : How I Overcame IBS (Irritable Bowel Syndrome) and Became Symptom free! How I Overcame IBS (Irritable Bowel Syndrome) and Became Symptom free! It seems like I was plagued with stomach problems my whole life. When I was 2 years old, I was hospitalized with Gastroenteritis and ever since then I had stomach issues. I was chronically constipated which I knew nothing about as a child, so it just became the norm for me to end up with stomach pain and eventually unpleasant and very painful trips to the bathroom. It would always come on by complete surprise, it didn't matter if I was at home, school or on a road trip with my family. It wasn't until about 17 years ago when my stomach issues became chronic for a period of time and I finally came across a Doctor who tested me for H-Pylori (Helicobacter pylori) which is a type of bacteria and was discovered to be the cause of ulcers. According to WebMD "about two-thirds of the world's population has it in their bodies" but many are asymptomatic. I tested positive and by that time I had become very weak, lost a lot of weight and was having a hard time functioning or even eating. I was referred to a friend of a friend who was somewhat of a health expert. The first thing he did was build up my system by introducing a special type of probiotic / Primal Defense (good bacteria) to my body and also started me on some whole food vitamins as well as Colostrum. He explained how we all have good and bad bacteria in our bodies and how the probiotics fill our system with the good bacteria. He also pointed out how antibiotics cannot tell the difference between good and bad bacteria so they just kill off everything and taking probiotics puts the good bacteria back into our bodies (there is too much info to go into regarding probiotics so I will leave a link all about them down below). I became stronger and felt better, but I wanted to make sure I got rid of the H-Pylori, so I treated it medically and continued with the vitamins and probiotics. This made it so I was strong enough to handle the medications for the eradication of the H-Pylori. After the treatment, I decided to continue with the probiotics because they had made such a significant difference in how I felt overall; they made me very regular for the first time in my life, helped clear up my skin (I suffered from acne), cleared up all of my IBS symptoms, and I noticed a boost in my immunity! All probiotics are not created equal. This is a different type of probiotic, I have posted links and a bit of info on this below. I admit to "cheating" on my Primal Defense and trying other probiotics, they didn't work for me and I quickly started to become constipated and develop IBS symptoms again. Obviously, I haven't been able to try all of the probiotics out there, but as they say "if it ain't broke, don't fix it." 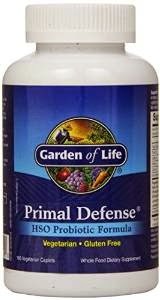 Primal Defense is what works for me, it's like the Rolls Royce of probiotics to me. -Info on Primal Defense from Iherb's Website: "Primal Defense is a natural blend of 12 species of probiotics and Homeostatic Soil Organisms (HSOs), utilizing the Poten-Zyme process and delivered within a whole food matrix. The HSO probiotic blend in Primal Defense helps support a normal gastrointestinal balance of good and potentially harmful bacteria to help maintain a balanced, healthy internal environment, and maximizes the benefits of a healthy diet by supporting normal absorption and assimilation of nutrients in the gut." I am just sharing my story in hopes of helping someone else who is suffering. I am not a health professional and I always suggest asking your Doctor before taking any supplements, especially if you take medications or have any medical conditions. And, all products have been purchased by me. I hope some of you find this helpful. If you have any questions or comments please post below. And, share with your friends!